Until now hoteliers and house-owners by the coast were the envy of Puri, Orissa's most popular tourist destination. Today they fear losing it all to the sea that is fast advancing inland; it has already touched part of the 1.5 km road running along the shore in Sipasarubali area. If hotel owners fear loss of business, property owners are nervous because banks are no longer as willing to give loans against Puri's beachfront assets. Erosion has destroyed their credit-worthiness. "If someone from the area comes to us for a loan, I think we will have to tell him we can't help," said Devi Dutta Mohanty, appraiser of hdfc home loans, Bhubaneswar. Banks normally fall over one another to get to the customer with a house loan. But now that the property in the area is threatened by erosion, "it puts a big question mark on the collateral against which we will give the loan," said Kailash Chandra Sahu, manager, Vijaya Bank, Puri. In a city that thrives on tourism the fear among hotel owners runs deeper. Erosion of the 35 kilometre of beach between Puri and Konark, another very popular tourist spot, could mean loss of business. The twin towns are popular with both domestic and international tourists. Business is brisk along the coast. Hotels of all categories--from the high end to the low--run a full house all the eight dry months of the year. Restaurants, cafes and eateries that dot the beach can barely cope with the demand for fresh lobsters and crabs from their tourist patrons. All this may come under sea water if erosion continues. "We are so worried. This will affect the entire tourism trade here," said Vikas Das, an executive with Hotel Hans Coco Palm. "We have asked the government to intervene," said another hotelier, Ramkrushna Das Mohapatra of Puri Beach Resort. The administration in Puri responded by laying stone boulders and sand bags on the road embankment sloping down to the beach. But this is a temporary measure for which the government has sanctioned Rs 7 crore. Naturally, it has not generated hope. "The sea had never advanced this far ever. Now that it has come up to touch the road people are afraid to build houses here," said Harish Mohanty, a resident of Sipasarubali area. While the government looks for a solution in geotextile tubes (wave breakers made of high grade rexin) and in building a sea wall, the final decision will come as a comprehensive state government project, said Orissa's director, environment, Bhagirathi Behera (see Bureaucracy on the beach, Sept 16-30). The project, he added, is expected to get a Rs 100 crore assistance from the World Bank under the Integrated Coastal Zone Management Plan. "We will be submitting the detailed project report soon. This will be for the Gopalpur-Chilika and Dhamra-Paradip stretches," said Behera. 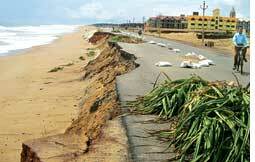 Officials said the government has also decided to set up a coastal erosion project directorate. N K Mahalik, retired geology professor of Utkal University, Bhubaneswar, attributes coastal erosion to global warming: "Rising temperatures have led to rise in the sea's water mass. The sea is expanding everywhere with this rise in its water mass. During monsoon storms this excess water gets an added thrust and starts eroding the coast. " At the present rate of increase in global temperatures, explained Geological Survey of India's Subhranshu Bhushan Ray, the temperature of the ocean surface is estimated increase by about 2C from today's levels by the middle of this century. "In that case the ocean surface will rise by 15 to 30 cm. This will mean higher waves and much greater wave energy, leading to much deeper ingress of the sea into the landmass," he said. Ray recommends the Orissa government does what Australia and the us have done to protect their beaches from erosion. One is to make a series of low walls stretching into the sea from land which would act as water barriers. The waves would dissipate their energy on them, thus reducing the chances of beach erosion. The other method is known as beach nourishment wherein sand from the areas of excess is pumped and deposited in areas of deficiency caused by erosion. "We can use both these methods to good effect," said Ray.